The Don't Leave Me in Here — It's Hot! flier has saved countless animals' lives over the years. With its tips on prevention and treatment, the flier has proven to be a painless reminder that alerts someone of the dangers of leaving animals in the car while he or she is shopping. 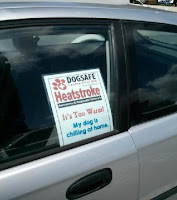 Whenever you see a parked car with animals inside, place a Don't Leave Me in Here — It's Hot! flier under the windshield wiper. Get the word out to individuals and communities about the dangers of hot cars through our life-saving Don't Leave Me in Here — It's Hot! Fliers, posters, and other educational materials. 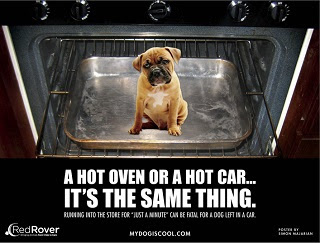 Remind others not to leave their dogs in parked cars with materials like our A hot oven or a hot car poster and our Hot Temperature warning sign. You make great choices about leaving your dogs at home when it's too warm outside ... now teach others by displaying your safer choice. Group dynamics is strong -- let's use this power for positive change! One day we will see these posters on tons of cars in hot parking lots and not a single dog locked in a car. Are you with us? Thank you for sharing this post, all you awesome dog-lovers... dogs everywhere will thank you too!